In the United States, community health workers (CHWs) help us meet our national Healthy People goals by conducting community-level activities and interventions that promote health and prevent diseases and disability. CHWs are trusted, respected members of the community who serve as a bridge between their community members and professionals in the field of health and human services. They provide an important service by establishing and improving relationships between these professionals and members of the community. As community health educators and role models, CHWs promote, encourage, and support positive, healthful self-management behaviors among their peers. As community advocates, CHWs help people get the services and follow-up care they need. CHWs serve as patient and community advocates, as “coaches” for disease management, and as patient “navigators,” guiding patients through the health care system. They also strengthen their community’s understanding and acceptance of medical care. The recognition of their successes has led to recommendations that CHWs be included as members of health care teams to help eliminate racial and ethnic disparities in health care (see Appendix A: Resources at the end of this sourcebook). The sourcebook contains information and activities on heart disease and stroke and on the major risk factors for these diseases in adults. It also contains information on risk factors that begin in childhood. Additionally, it addresses people’s adherence to treatment and their communication with health care providers. Because the sourcebook contains some technical information, it is recommended for CHWs who already have some experience in their profession. The sourcebook is not a replacement for basic CHW training, which addresses core skills (See The National Community Health Advisor Study, Chapter 3: Core Roles and Competencies of Community Health Advisors; May 1998 University of Arizona, Tucson, Arizona, in Appendix A for more information). Examples of some basic CHW training curricula are listed in Appendix A: Resources at the end of this sourcebook. Although the sourcebook does not address “patient navigation,” Appendix A lists a link to a useful online toolkit that contains information on the topic; also, a future online version of this sourcebook will provide updated information on patient navigation. The sourcebook is a resource that builds on strong partnerships between the National Center for Chronic Disease Prevention and Promotion at the Centers for Disease Control and Prevention (CDC) and other agencies and organizations. The material in the sourcebook has been adapted from The Women’s Wellness Sourcebook: Module III: Heart Disease and Stroke and was developed for CHWs by the International Medical Services for Health, an international nonprofit organization. Staff within CDC have updated, reviewed, provided additional content, and pilot-tested the sourcebook. They have done so in partnership with the University of Alabama at Birmingham Research Prevention Center; the American Heart Association; the American Stroke Association; the National Heart, Lung, and Blood Institute (NHLBI); the Indian Health Service (IHS); the National Institute for Neurological Diseases; and the Oak Ridge Institute for Science and Education. The sourcebook reflects the latest research and national guidelines on heart disease and stroke and their prevention. 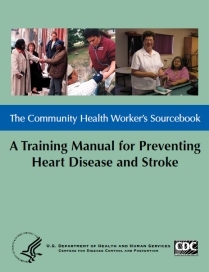 The sourcebook follows the familiar format of the well-known NHLBI training curricula Your Heart, Your Life: A Lay Health Educator’s Manual[PDF–3.7M] and Honoring the Gift of Heart Health: A Heart Health Educator’s Manual for American Indians and Alaska Natives. This format makes the sourcebook a compatible training companion for those familiar with the NHLBI training manuals. The sourcebook references the Web sites and products of other federal agencies and of private or not-for-profit organizations. A reference in the sourcebook to a specific Web site, commercial product, process, service, or company does not constitute its endorsement or recommendation by the U.S. government or by CDC. We thank you for your interest in this new resource. We welcome feedback on your experiences in putting it to use. We are producing a limited number of hard copies of the sourcebook, but we plan to make English and Spanish language versions available on CDC’s Division for Heart Disease and Stroke Prevention’s Web site in the near future. Please send your comments on this sourcebook to Contact CDC-INFO. This course is designed to provide state programs and other stakeholders with basic knowledge about Community Health Workers (CHWs), such as official definitions of CHWs, workforce development, and other topic areas. In addition, the course covers how states can become engaged in policy and systems change efforts to establish sustainability for the work of CHWs, including examples of states that have proven success in this arena. The course sessions are self-paced. Completion time for each session is between 30–45 minutes. The user does not have to take each session in succession. At the conclusion of each session, there is a five-minute survey to assess your satisfaction. Please click on the link, which goes to SurveyMonkey, and complete the survey. This course was a collaborative effort between the Division for Heart Disease and Stroke Prevention (DHDSP) and the REACH Program of the Centers for Disease Control and Prevention (CDC). The primary author of this course is Carl Rush, MRP of Community Resources, LLC. The developers of the course are GEARS, Inc. and C2 Technologies. The course is provided free of charge from the DHDSP web site. CDC, our planners, and our content experts disclose they have no financial interests or other relationships with the manufacturers of commercial products, suppliers of commercial services, or commercial supporters. The CDC does not receive commercial support for this activity. VISION: Empower communities to create environments that will help people be healthier. MISSION: To create and support CHW programs that help meet public health goals.